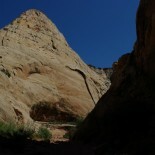 On a previous visit, we spent just a few hours in the park, hiking to Hickman Bridge — a breathtaking natural bridge. 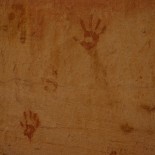 The rock around the bridge is covered with red handprints likely of Native American origin. 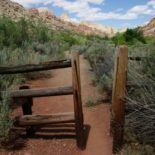 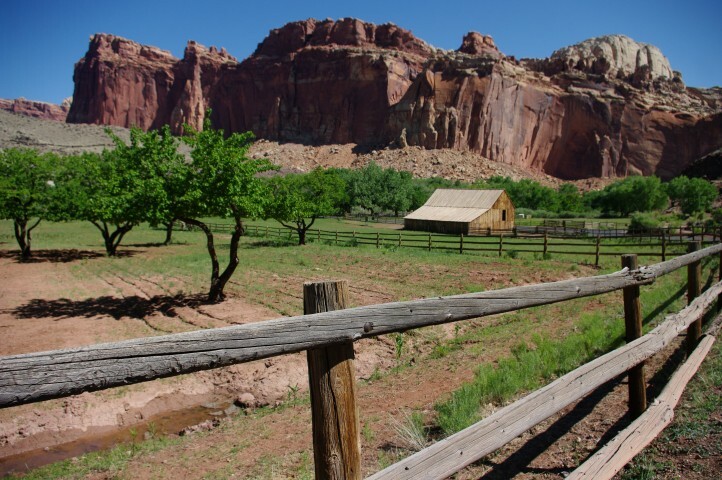 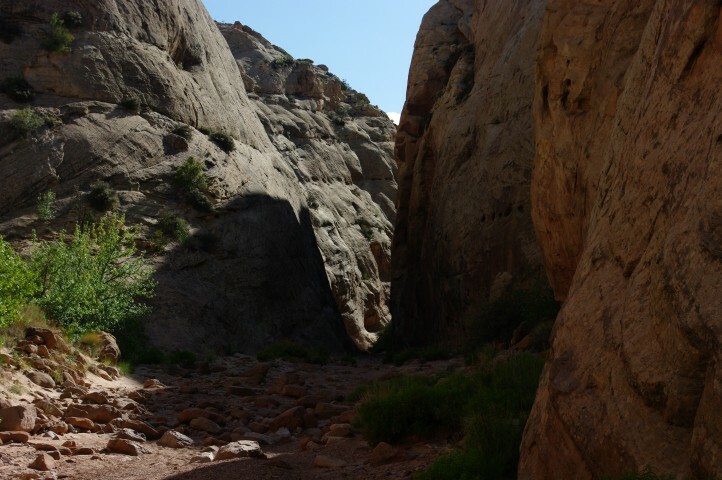 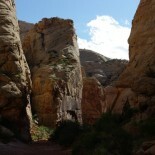 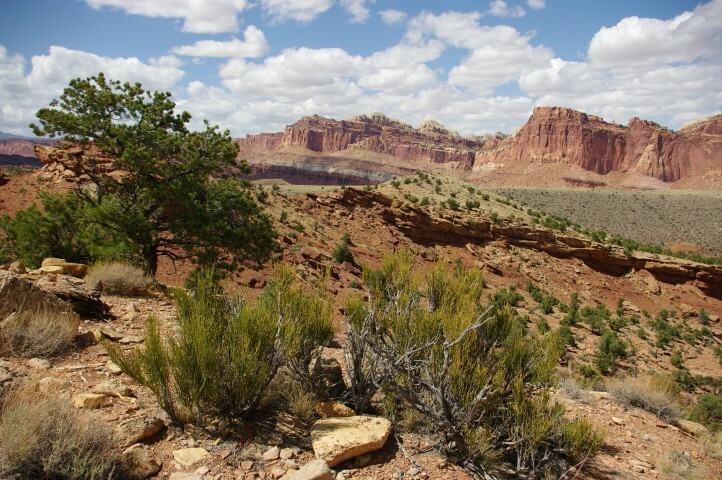 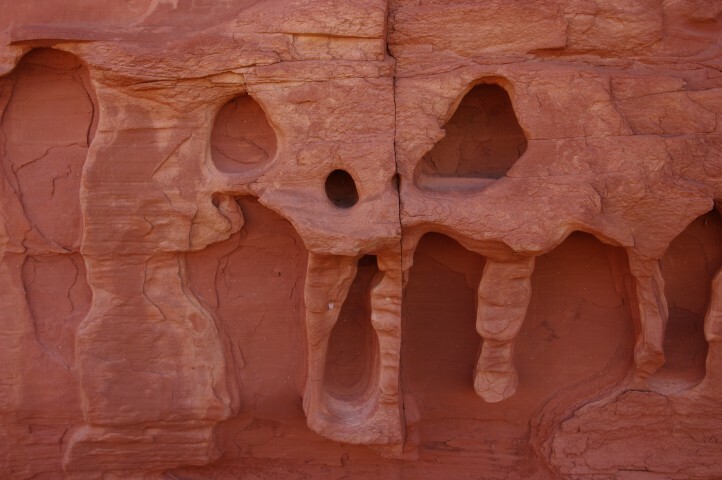 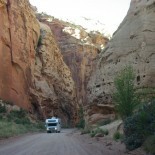 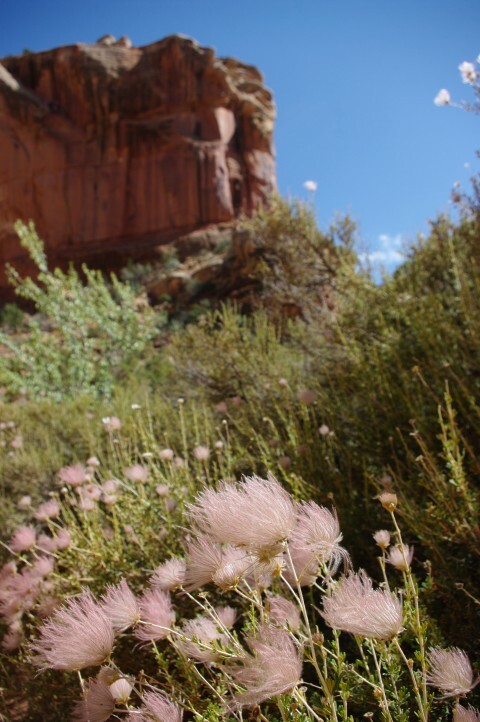 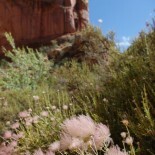 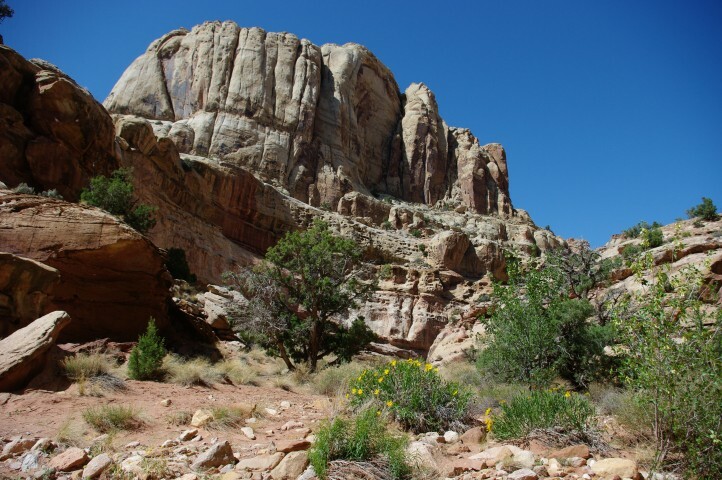 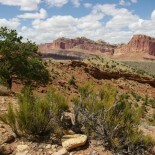 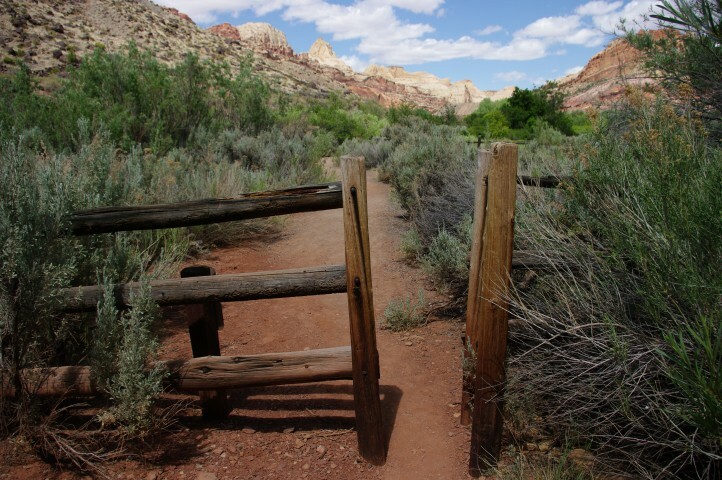 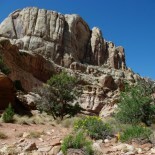 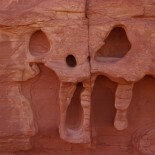 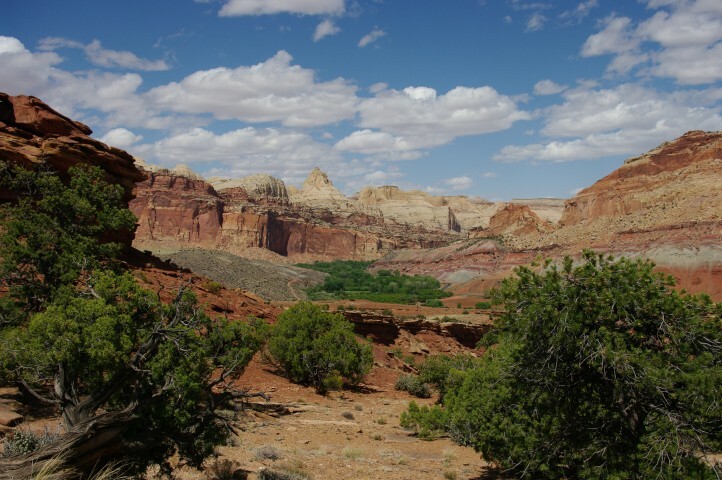 Capitol Reef preserves an interesting combination of human history and natural beauty. 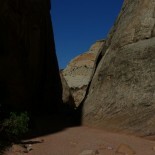 This time we wanted to explore a little more. 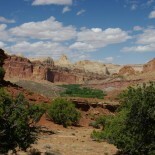 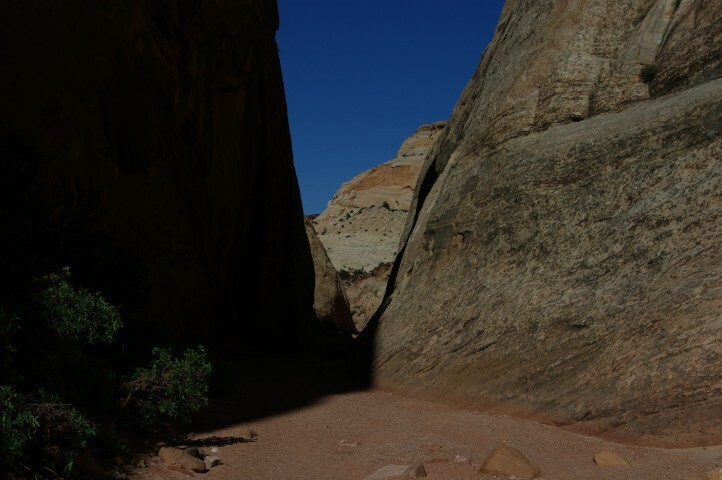 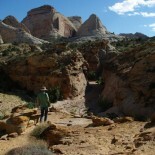 Unlike other parks (and like the campground), most of the trails we sampled in Capitol Reef were pretty busy. 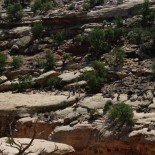 The hiking is not easy, but large ranges of people were giving it a try. 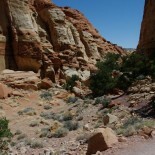 Only a small section of the park is easily accessible via passenger car. 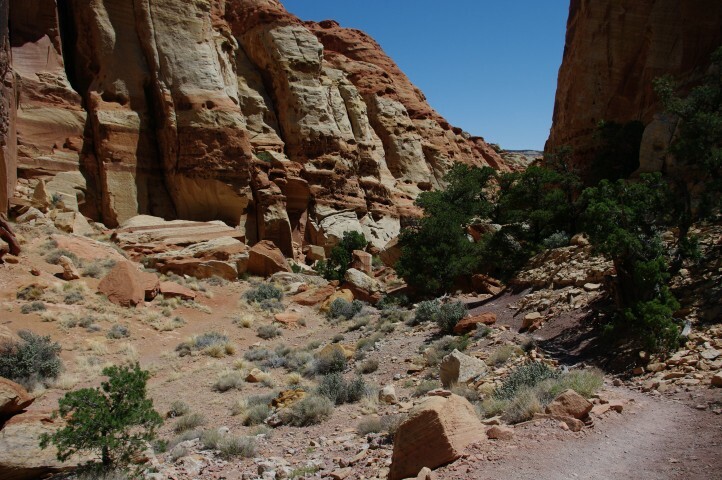 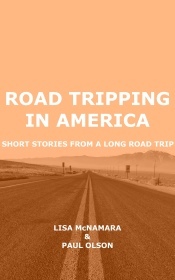 Next time we visit southern Utah, we’re bringing a Jeep, and we’re going in deep. 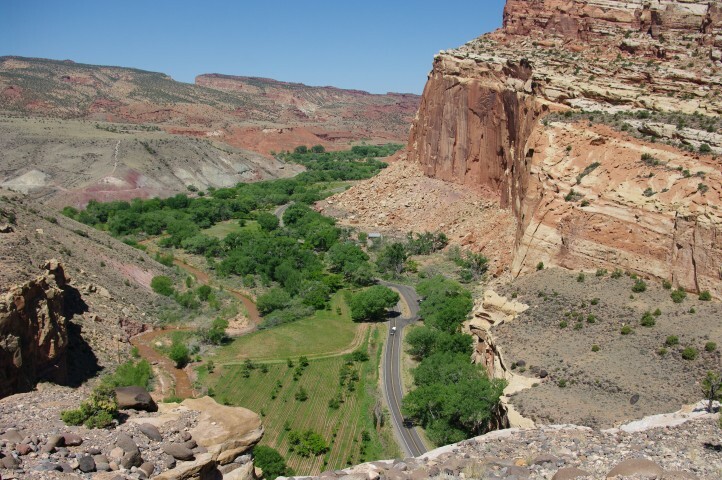 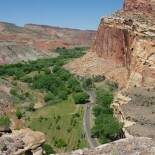 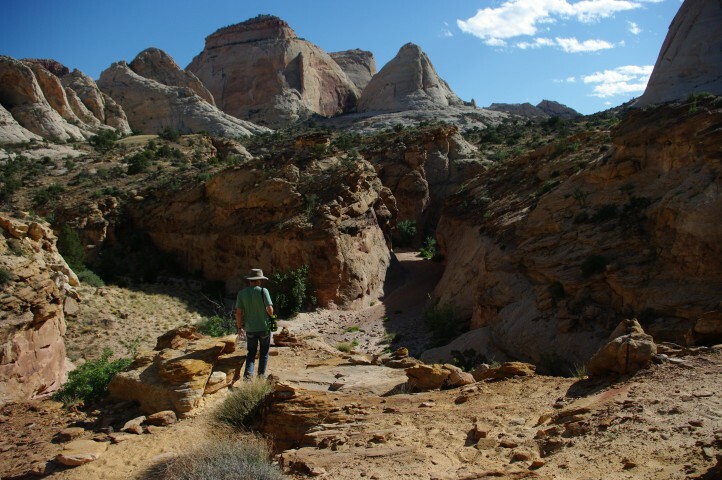 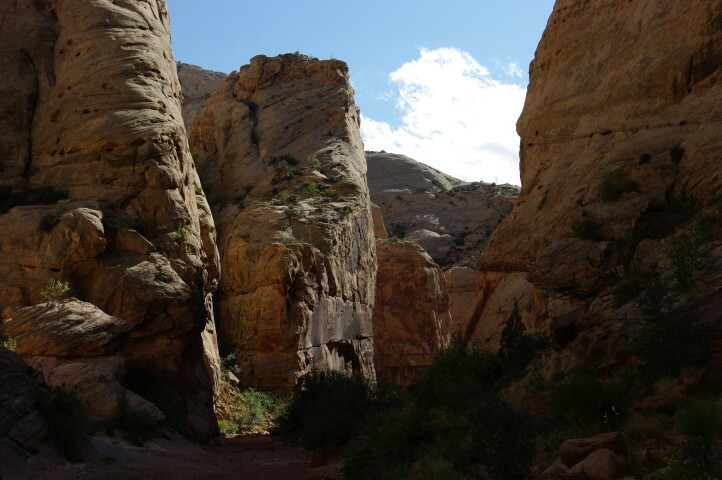 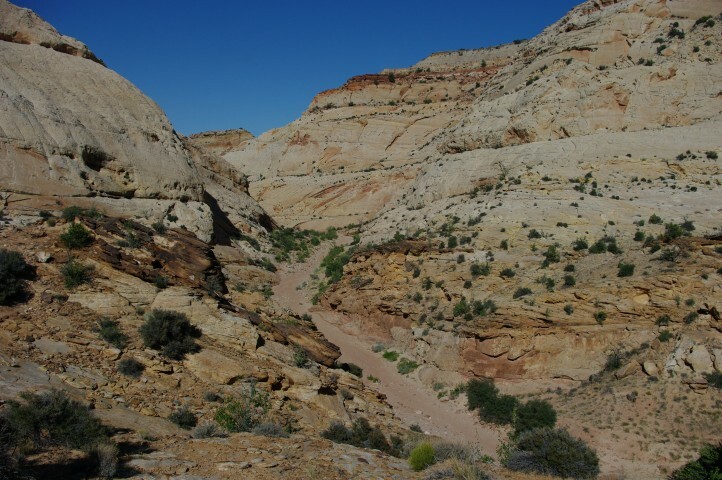 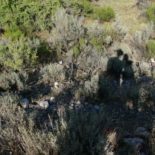 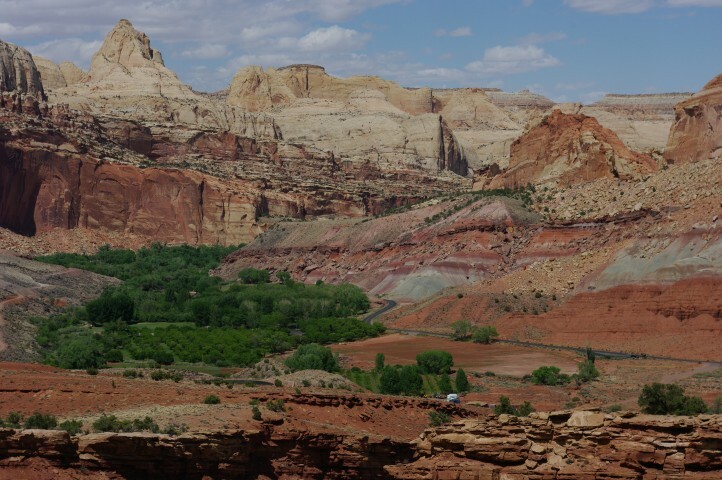 The Fremont River Overlook is a great trail for getting a relatively easy overview of the Waterpocket Fold, the most prominent geological feature in Capitol Reef. 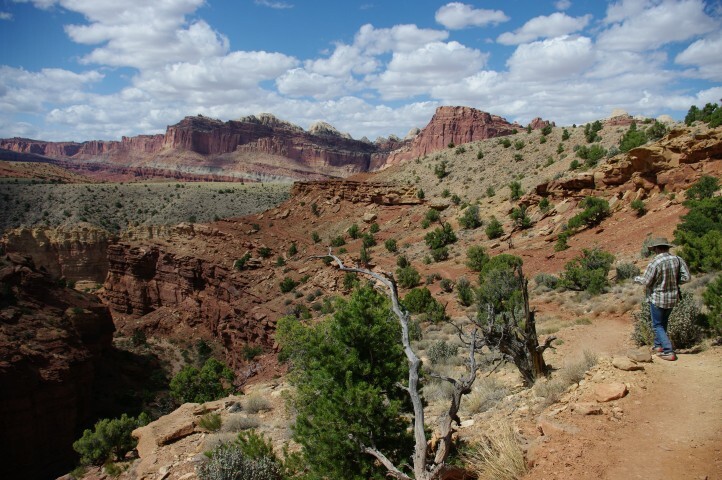 Even after you read about how the earth’s crust folded over on itself, it’s still hard to visualize. 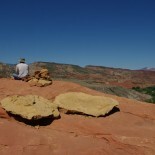 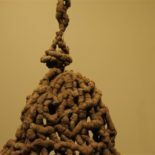 You can spend some time up here just looking at the Fold, trying to puzzle it out. 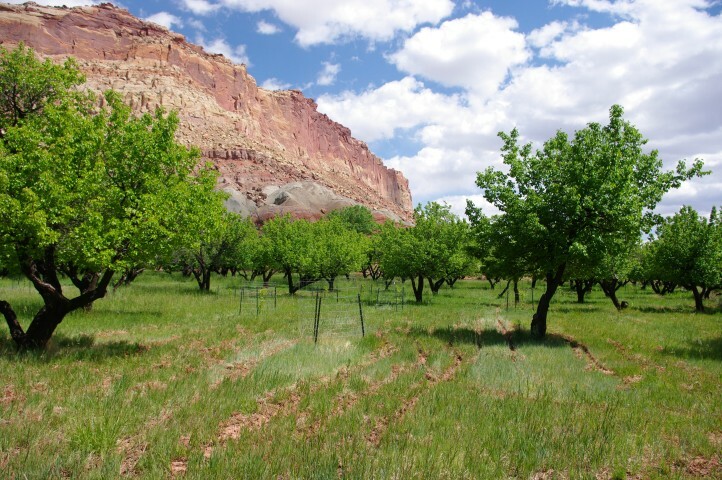 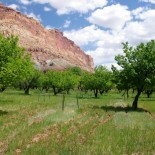 The Park Service is required to maintain the orchards that cover the valley floor. 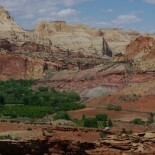 The campground is in the orchard below. 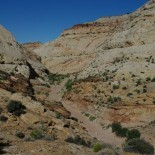 The Waterpocket Fold from the Fremont Overlook trail. 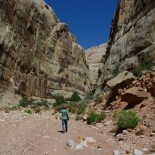 This hidden canyon is OK — but I’m a little canyon spoiled, and it wasn’t dramatic enough for me. 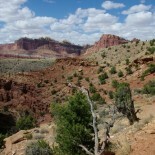 But the views from the overlook are spectacular. 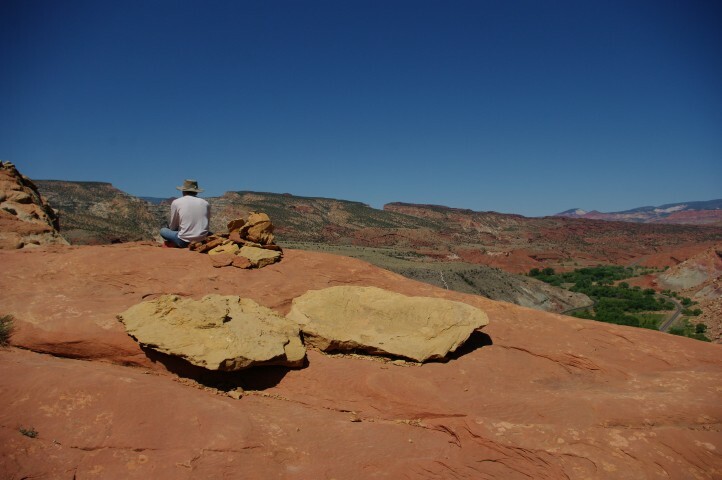 This is another good place to contemplate the Fold and our impact on wild places. 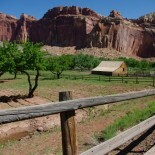 An old barn on the valley floor. 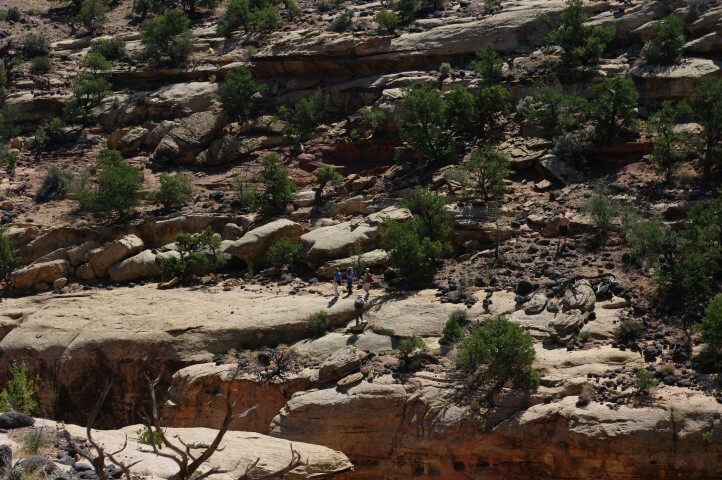 We tried to help this family find their way back to the trail. 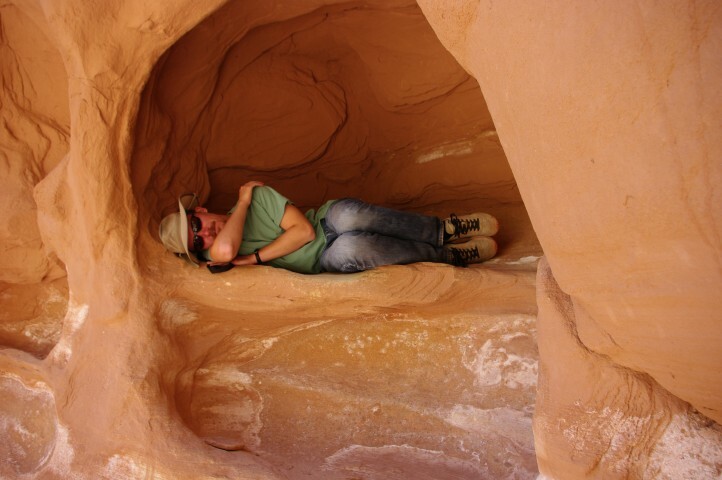 Grand Wash is a fun place to pretend to be a water droplet. 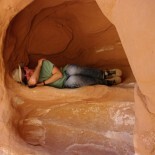 Paul hiding from the intense sun. 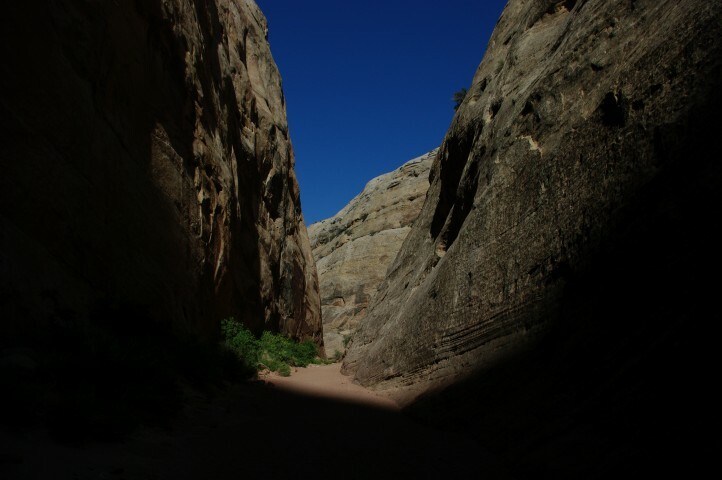 Sunlight in the narrows section of the wash.
Capitol Gorge has it all. 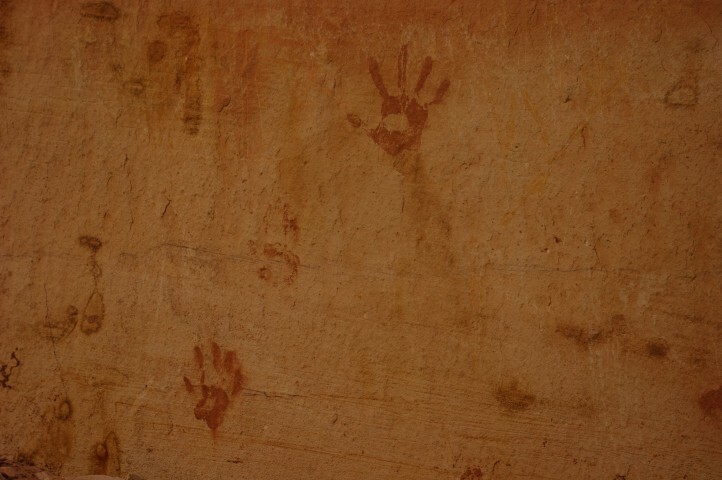 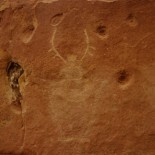 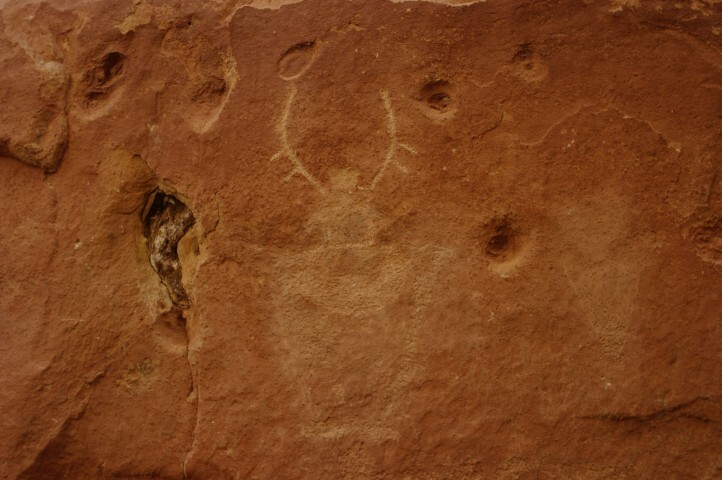 Petroglyphs and handprints can be seen shortly after you leave the trailhead. 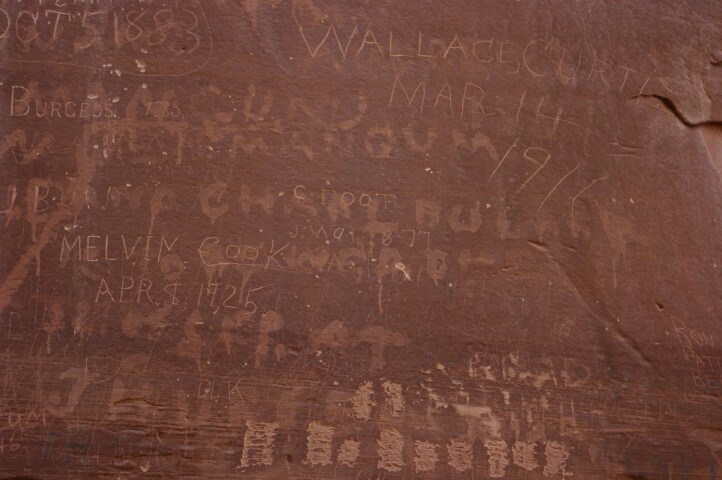 A little farther, pioneers passing through the canyon in the late 1800s and early 1900s scratched their names and journey dates in the rock. 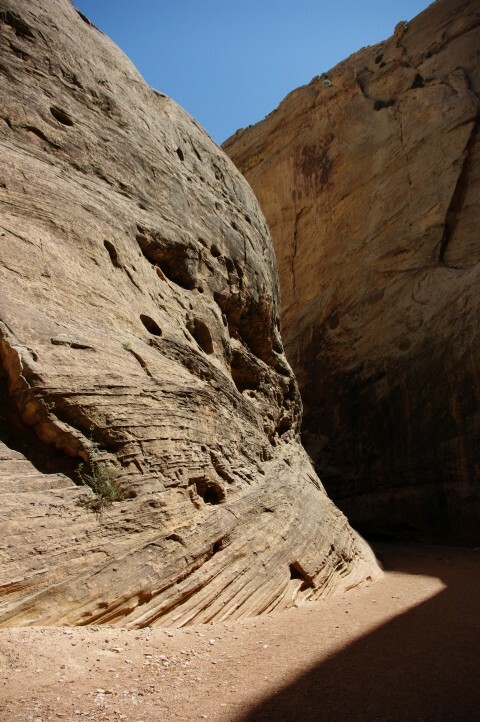 We were wondering how the natives and the pioneers managed to scratch into the rock so far above our heads, picturing them standing on one another’s shoulders or on rocks or cars, until we realized we were actually seeing evidence of the gorge floor eroding over the past centuries. 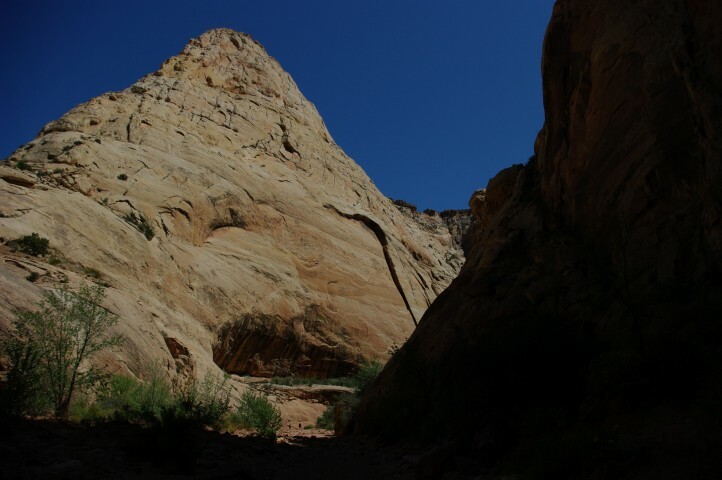 There’s a spot where you can climb up out of the gorge to see some tanks, deep pockets in the rock where rainwater collects and an important source of water for wildlife. 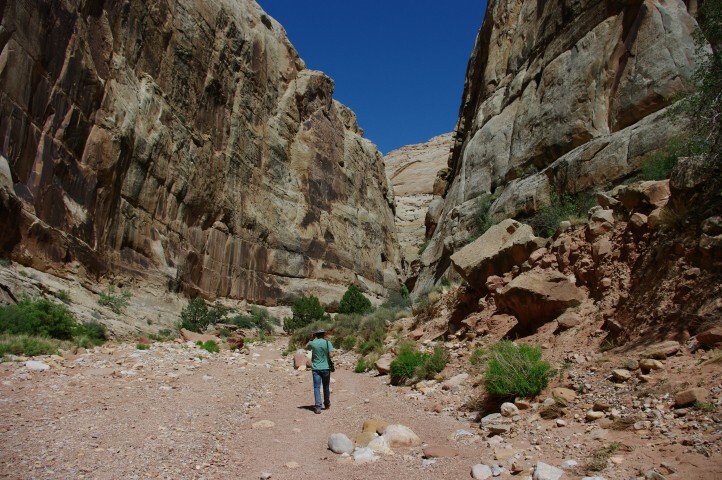 When I was here with my family as a kid, we saw some disturbingly fresh mountain lion tracks in the sand in a tank, but Paul and I didn’t spot any tracks this time. 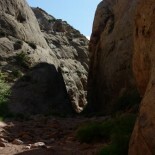 In addition to all this, it’s also a really interesting gorge. 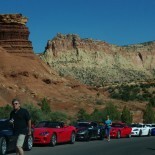 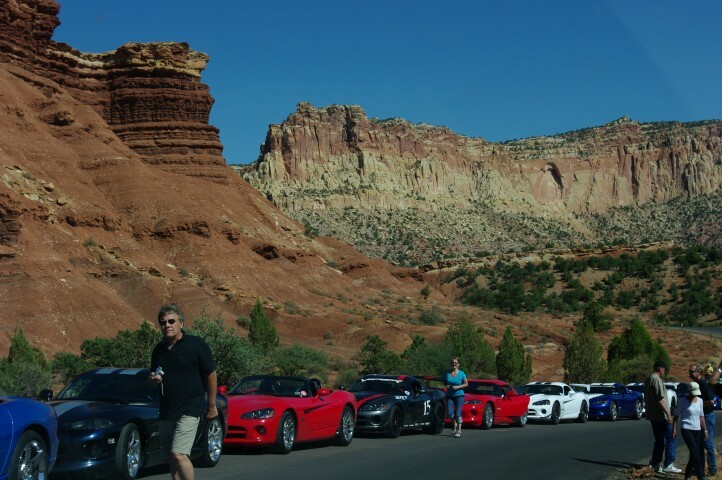 Every Viper owner in the US was gathered on the scenic drive. 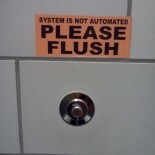 There must have been 20 of them. 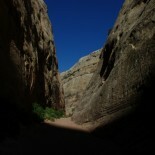 Looking down on the gorge from above. 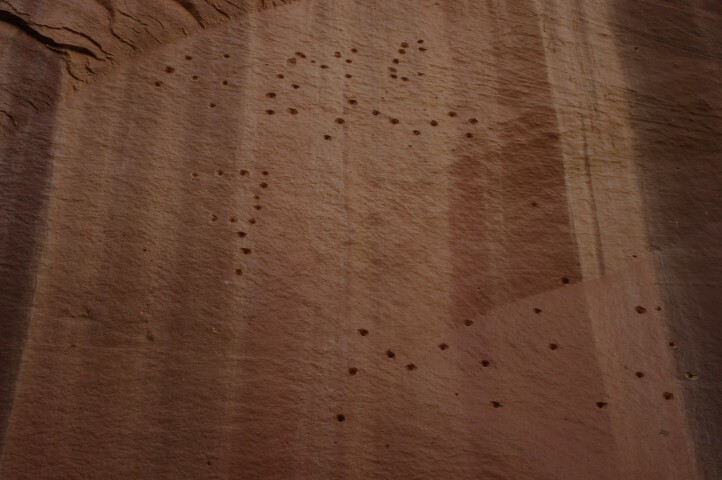 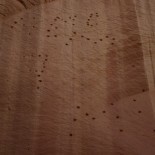 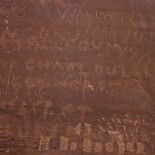 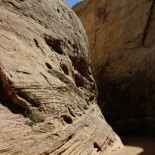 Pioneers scratched their names into the rock in Capitol Gorge. 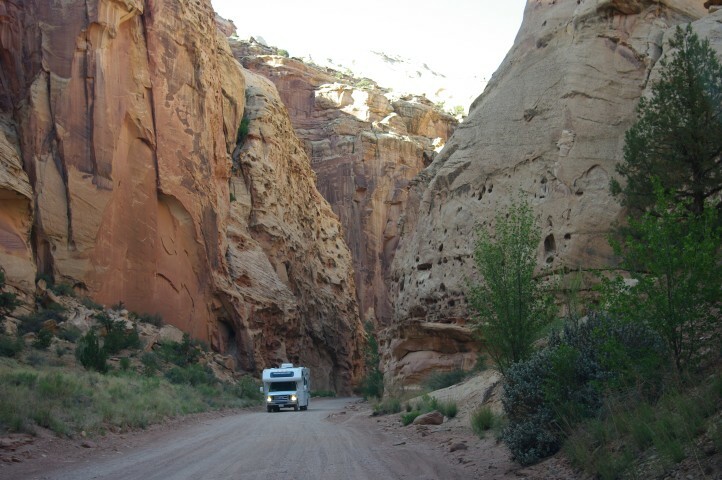 An RV attempting the rough drive to the trailhead.